Whether Big Mouth LOUD is a success or not thus far depends on who you ask. I have my own doubts since their cards are infrequent and they don't draw great (although decently), and I feel like Shibata is wasting away part of his career being the ace in a company that doesn't seem to be accomplishing much. Recently Shibata announced that he is now a freelancer, with the future of Big Mouth LOUD in a confused state. I don't wish failure of any promotion and I enjoy BML for the most, I just wonder sometimes what the point is. I actually get to review a Yoshitsune match, today is a happy day. Yoshitsune dropkicks AKIRA twice to start the match, goes off the ropes, but AKIRA catches him with a kick. Irish whip by AKIRA and he delivers a dropkick of his own. Yoshitsune rolls out of the ring to re-group, AKIRA goes for a baseball slide, but Yoshitsune moves out of the way and rolls back into the ring. AKIRA gets on the apron, but Yoshitsune dropkicks him back down to the floor. Yoshitsune then goes off the far ropes and flies out of the ring with a somersault tope suicida, with both he and AKIRA landing in the front row. They really need to move back the railing in BML, that is two straight matches that wrestlers have landed in people's laps. Yoshitsune jumps back into the ring first, but he gets tired of waiting for AKIRA and goes out to get him. The two trade blows on the outside, Irish whip by AKIRA, but it is reversed and AKIRA goes crashing into the railing. Yoshitsune slides AKIRA back into the ring, snapmare, he goes off the ropes and dropkicks AKIRA in the face. Yoshitsune then quickly goes out to the apron and comes back in the ring with a springboard elbow drop. Cover, but it gets a two count. Stomp to the back by Yoshitsune and he applies a reverse chinlock until AKIRA gets a foot on the bottom rope. AKIRA goes to the outside, Yoshitsune follows, but AKIRA throws him into the guard rail. AKIRA goes back into the ring, Yoshitsune gets up on the apron, but AKIRA catches him there and goes for a vertical suplex. Yoshitsune blocks it though and snaps AKIRA's head onto the top rope. Yoshitsune goes for the 619, but AKIRA moves and rolls out of the ring. He then drags Yoshitsune out with him and twice rams him back-first into the ring post. AKIRA rolls Yoshitsune back into the ring and starts twisting on his leg. Dragon screw leg whip by AKIRA and he applies the figure four leg lock. After struggling for a minute Yoshitsune reaches the ropes, but AKIRA rolls to the outside while keeping the hold applied. He finally lets go and stomps Yoshitsune's leg out on the floor before throwing him back into the ring. AKIRA continues working over Yoshitsune's leg before going back to the figure four. Again Yoshitsune makes it to the ropes, but AKIRA dropkicks him in the knee. Another dropkick to the leg by AKIRA and he gives Yoshitsune a third one. Knee crusher by AKIRA, he picks up Yoshitsune and delivers a vertical suplex. Cover, but it gets a two count. AKIRA puts Yoshitsune up on the top turnbuckle, but Yoshitsune punches him off. Yoshitsune goes for a tornado DDT, but AKIRA swings his injured leg into the turnbuckle. Irish whip by AKIRA and he hits a spinebuster before dropping an elbow onto Yoshitsune's leg. AKIRA goes up to the top turnbuckle and hits a splash right down onto Yoshitsune's leg. STF by AKIRA, but Yoshitsune wiggles his way to the ropes and AKIRA has to break the hold. Stomp to the leg by AKIRA, he picks up Yoshitsune and kicks him back into the ropes. Yoshitsune fires back with a forearm, he goes off the ropes and hits another one, but AKIRA kicks him in the leg. AKIRA grabs Yoshitsune's leg, but Yoshitsune connects with an enzigieri. Yoshitsune goes off the ropes, avoids AKIRA and hits a spinning headscissors takedown. AKIRA rolls out of the ring, Yoshitsune goes off the ropes, but he flips himself back into the ring when he sees that AKIRA is watching him. Yoshitsune then charges the side ropes and goes for a quebrada to the outside, but he doesn't jump far enough over and ends up mostly hitting the ropes before rolling down onto AKIRA. AKIRA gets back into the ring first, Yoshitsune gets up on the apron and comes back in the ring with a springboard missile dropkick. Cover, but it gets a two count. Yoshitsune grabs AKIRA around the waist and picks him up, but AKIRA elbows out of it and slaps on the STF. Again Yoshitsune manages to get to the ropes and AKIRA releases his hold. Match Thoughts: The initial report I read said this match was sloppy and had a lot of botches, but really there was only one botch and there were very few miscommunications. Course, the match was over 17 minutes, so such things are bound to happen when one of the wrestlers is relatively inexperienced. I was shocked (and pleased) that AKIRA gave Yoshitsune so much here, as he didn't have to considering his senior status over the young high flyer. Yoshitsune is hard to describe, he is just so quick and nimble with everything he does. For example, after he landing on the other side of the railing because of his dive, to get back in the ring he stepped onto the railing, hopped to the apron, and then slingshoted himself back into the ring. As long as he doesn't kill himself, Yoshitsune will be a great Jr. Heavyweight down the road. Goto and Ohara dump the referee out of the ring as soon as they get into it, and Ohara jumps on the mic to explain their actions. He seems angry. Ishikawa and Inoue come down to ringside and they start brawling in the crowd. They brawl in the crowd over the next several minutes, with nothing worth me doing play by play for. They never get into the ring. Goto and Inoue are up in the stands, with Goto having a chair for much of the struggle as he hits anyone with it that gets near him. Ohara grabs a chair as well and they both pummel Ishikawa and Inoue. Ishikawa and Inoue finally fight back, but Goto hits Inoue with a blow blow. The bell is rung, the match is called a draw, and the crowd is not thrilled. Murakami and TARU start things off. TARU quickly bails from the ring though and he regroups outside with the other Voodoo Murderers. They then charge back into the ring when Murakami isn't looking, TARU takes Murakami up into the stands and throws him into the crowd. Meanwhile, Usuda and YASSHI are fighting at ringside, with YASSHI sending Usuda into the railing. TARU picks up Murakami where ever they are and rakes his eyes, while YASSHI maintains control over Usuda. Usuda fights back though with a series of mid-kicks, as TARU literally throws Murakami out of the building. He brings him back in as they slowly work their way back to ringside, and Kondo slides Murakami into the ring. All three members of the Voodoo Murderers stomp on Murakami as the crowd boos their morally apprehensible yet effective strategy. YASSHI throws Murakami into the corner and Usuda tags himself in. Usuda and YASSHI trade strikes, YASSHI goes for an Irish whip, but Usuda hangs onto the top rope. He finally succeeds, reversed by Usuda, and they continue trading strikes. Usuda wins the battle with a spinning heel kick, cover, but it gets a two count. Backslide by Usuda and he converts it an armbar, but it is quickly broken up. Usuda kicks YASSHI repeatedly in the arm and throws him into Hara's boot. Usuda tags in Hara, who forearms YASSHI into the corner. High kicks by Hara, YASSHI tries to fight back, but a punch sends him down to the mat. Hara picks up YASSHI and kicks him against the ropes while Usuda kicks him from behind. Hara tags in Murakami, and Murakami kicks YASSHI in his corner while Usuda holds him. All three men choke YASSHI in the corner, and Murakami tags in Usuda. Usuda picks up YASSHI and slams him to the mat. Cross armbreaker by Usuda, but it is broken up by Kondo and TARU. Usuda picks up YASSHI and connects with a high kick. He gets him to his feet again, snapmare, and he applies a reverse chinlock. YASSHI gets a hand on the ropes, but Hara kicks it off and YASSHI is choked by Murakami and Hara while Usuda talks to the referee. Back up, Usuda throws YASSHI into the corner and tags in Hara. Kicks to the chest by Hara, but YASSHI catches one and grabs his testicles. That's a fun reversal. Now it is Hara being triple teamed in the corner, and TARU is tagged in. TARU puts Hara into the ropes, he goes out to the apron and kicks him repeatedly in the chest. He then gets back into the ring and makes the tag to Kondo. Kondo picks up Hara and punches him to the mat, but Hara returns with strikes of his own. Kondo forearms Hara down to the mat and chokes him with his boot. Kondo throws Hara out of the ring, and TARU throws him into the guard rail before attacking him with the metal stick. Choke by TARU, and he slides Hara back into the ring. Kondo and YASSHI are waiting for him and they both dropkick him in the head. Cover by Kondo, but it only gets a two count. Kondo picks up Hara and throws him into the corner. YASSHI and Kondo then Irish whip him to the opposite corner corner, YASSHI and Kondo hit running lariats, and TARU follows with a running splash. Kondo assists YASSHI in hitting a splash, cover by YASSHI, but it gets a two count. Kondo comes back in and they hold up Hara so that TARU can give him a scissors kick to the groin area. Cover by YASSHI, but the referee is slow to count due to all the cheating I guess. YASSHI picks up Hara, but Hara snaps off a dropkick. Irish whip by Hara and he delivers a high kick before tagging in Murakami. Shibata charges Sasaki to start the match and hits a jumping knee. Kicks by Shibata and he uppercuts Sasaki into the corner. After two kicks to the chest, Shibata backs off, but then comes back with a dropkick. Backdrop suplex by Shibata and he kicks Sasaki in the back. Sasaki ducks a front kick, grabs Shibata and delivers a backdrop suplex of his own. Shibata rolls out to the apron and gets up, but Sasaki dropkicks him off and then sails out onto Shibata with a pescado. Sasaki gets back into the ring and Shibata eventually follows. 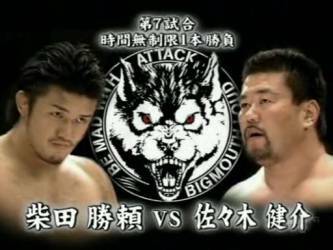 Sasaki and Shibata trade strikes, with Sasaki's chops winning most of the time. Shibata doubles Sasaki over with a pair of kicks however and stomps him down to the mat. Shibata picks up Sasaki and kicks him back down. Shibata throws Sasaki into the corner and connects with a pair of kicks to the chest. Elbows to the back of the head by Shibata and he goes off the ropes, but Sasaki catches him with a chop to the chest. Sasaki picks up Shibata and lariats him hard in the face. Again Sasaki picks up Shibata and chops him against the ropes. Headbutt by Sasaki, but Shibata comes back with a headbutt of his own. Another headbutt by Sasaki and he clubs Shibata to the mat. Cover, but it only gets a two count. Lariats to the back and front by Sasaki, he folds Shibata over for the cover, but Shibata kicks out. Lariat in the corner by Sasaki, he drags Shibata to his feet, Irish whip, and he hits another lariat. Cover by Sasaki, but it only gets a two count. Sasaki kicks Shibata in the head as he gets to his feet, they trade slaps, but Shibata floors Sasaki with a running kick. From top to bottom this was not a very good show. 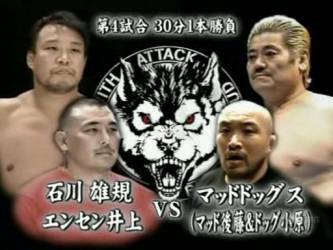 I really like AKIRA, Yoshitsune, Shibata, and Sasaki, and they all looked good on this card. The other matches however ranged from dreadful to decent, and if you never see any of these matches then I don't think you are missing much. Generally if I go an entire event without giving any match higher then a 7, that is a pretty bad sign, because I am pretty giving when it comes to ratings. BML is (was?) an interesting concept, but here we are at the sixth show and I still have no idea what they are trying to accomplish. I don't think they know either, which is part of the problem.